Objectivity’s ThingSpan is an enterprise-grade, distributed graph platform for analytics and relationship discovery at SPEED and SCALE. 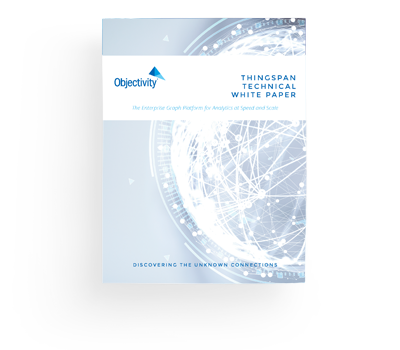 The Objectivity ThingSpan product is an enterprise-grade, massively scalable distributed platform for graph analytics and real-time relationship discovery. 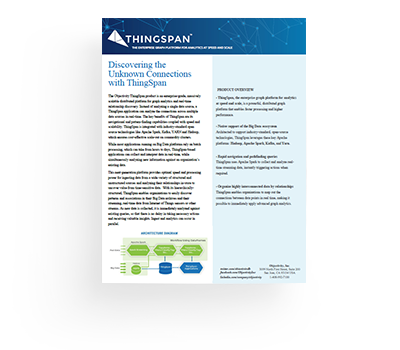 Instead of analyzing a single data source, a ThingSpan application can analyze the connections across multiple data sources in real-time. Integrate with industry-standard open source technologies: HDFS, Apache Spark, Kafka, Flume, and YARN. Cost-effective and scale-out on commodity clusters. ThingSpan scales out and up to spread workload with speed and scale, versus single machine in-memory graphs. ↠ This enables organizations to tackle problems of unlimited complexity. ThingSpan enables applications to perform ingest operations and queries in parallel across multiple data sources. ↠ This maximizes the use of potential expensive and scarce resources to get insights faster.